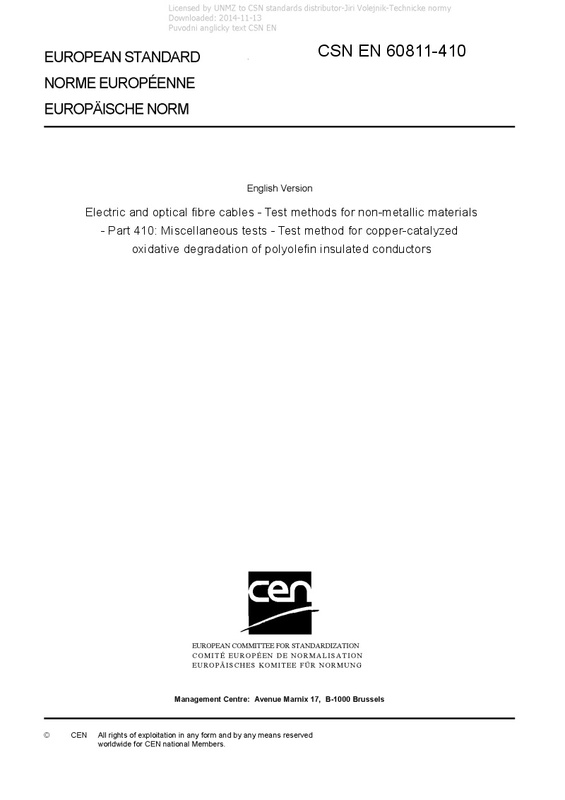 EN 60811-410 Electric and optical fibre cables - Test methods for non-metallic materials - Part 410: Miscellaneous tests - Test method for copper-catalyzed oxidative degradation of polyolefin insulated conductors - IEC 60811-410:2012 gives the procedure for copper-catalyzed oxidative degradation of a polyolefin, which is typically used for insulation in communication cables. IEC 60811-410:2012 cancels and replaces Annex B of IEC 60811-4-2:2004, which is withdrawn. Full details of the replacements are shown in Annex A of IEC 60811-100:2012. There are no specific technical changes with respect to the previous edition, but see the Foreword to IEC 60811-100:2012. This publication is to be read in conjunction with IEC 60811-100:2012.